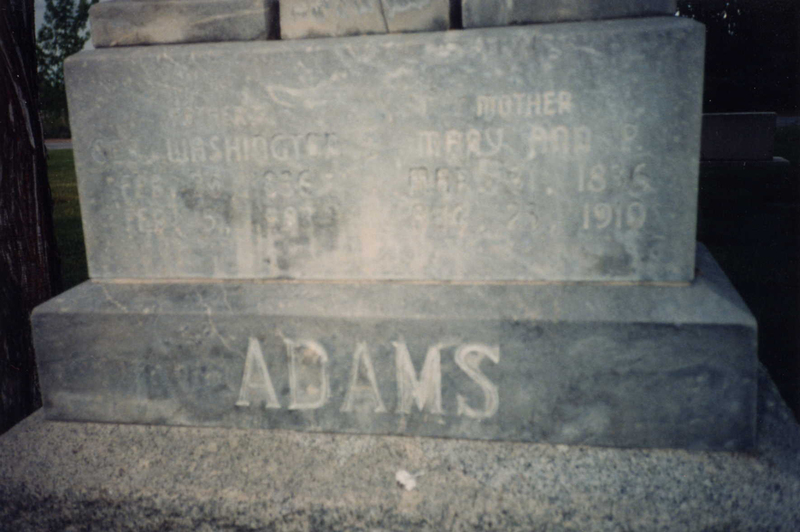 This site is dedicated to the descendants and ancestors of Elias Adams, and other related families. If you have comments or questions, or would like to share information, please contact us at postmaster@sedgwickresearch.com. More information, pictures, and stories will be added soon. Much of the new information, pictures, and headstone transcriptions comes from Dirk Smith. Thank you, sir, for all of your help and contributions! 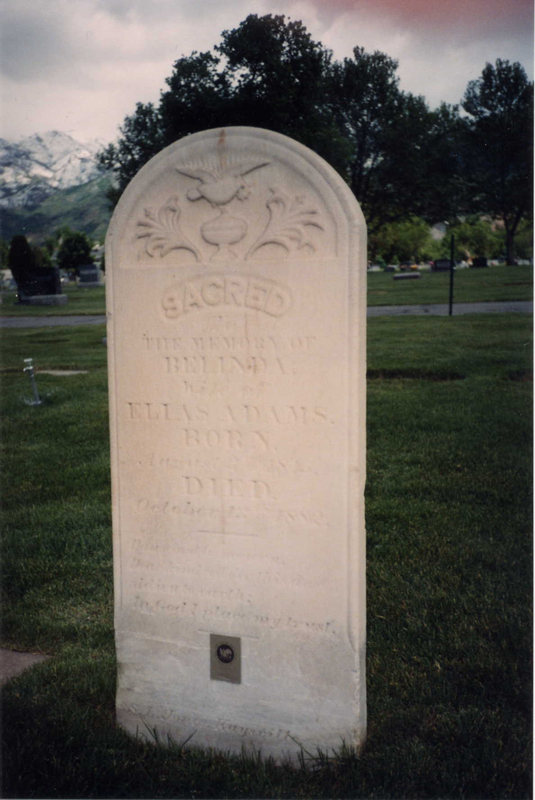 Elias Adams' Headstone: Elias was buried in the Kaysville Cemetery in Kaysville, Utah. 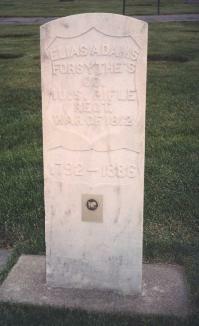 The inscription on the stone reads "ELIAS ADAMS FORSYTHE'S CO.1 U.S. RIFLE REG'T. WAR OF 1812 1792 - 1886." Photograph courtesy of Dirk Smith. Belinda Railey Adams' Headstone: Belinda is Elias's second wife. His first wife, Elmyra Caldwell, died while they were still living in Illinois. 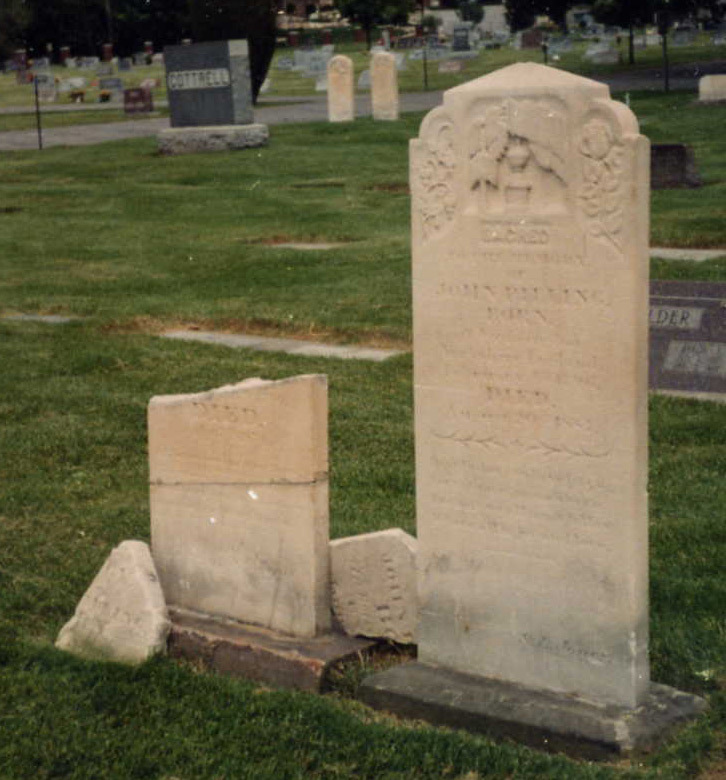 Belinda was buried in the Kaysville Cemetery in Kaysville, Utah. 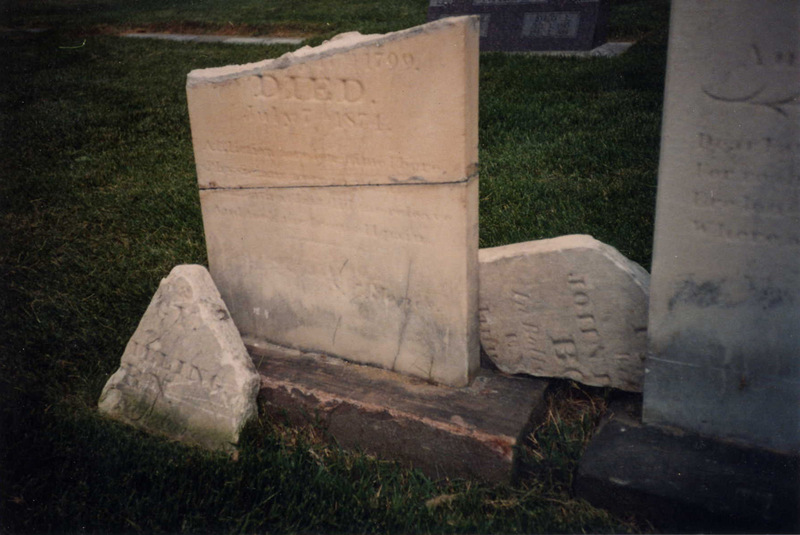 The headstone inscription reads: "SACRED TO THE MEMORY OF BELINDA Wife of ELIAS ADAMS BORN August 3, 1815 DIED October 13, 1882 Pause not to mourn Dear kindred o'er this dust Adieu to earth In God I place my trust. -S.L. Jones, Kaysville, UT." Photo courtesy of Dirk Smith. 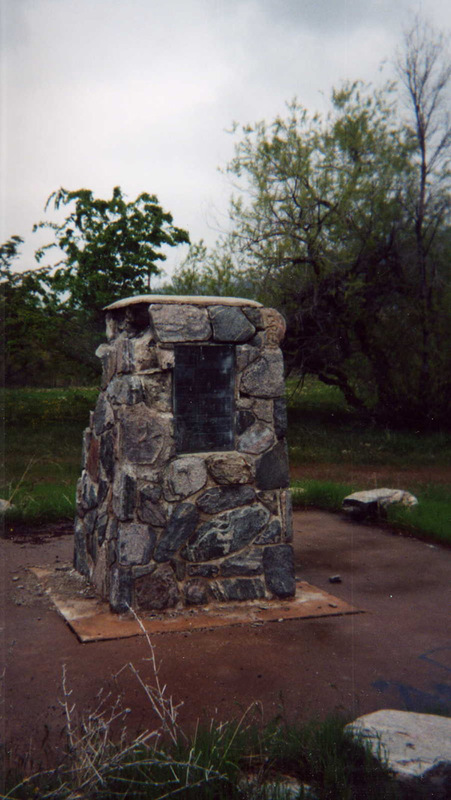 Photograph of Elias Adams Monument Park: The Pioneer Memorial Park (Elias Adams Monument Park) entrance is located at 2800 East and Oak Hills Drive in Layton, Utah. The Elias Adams monument is in the picture to the right. The photo and information are provided courtesy of Dirk Smith. 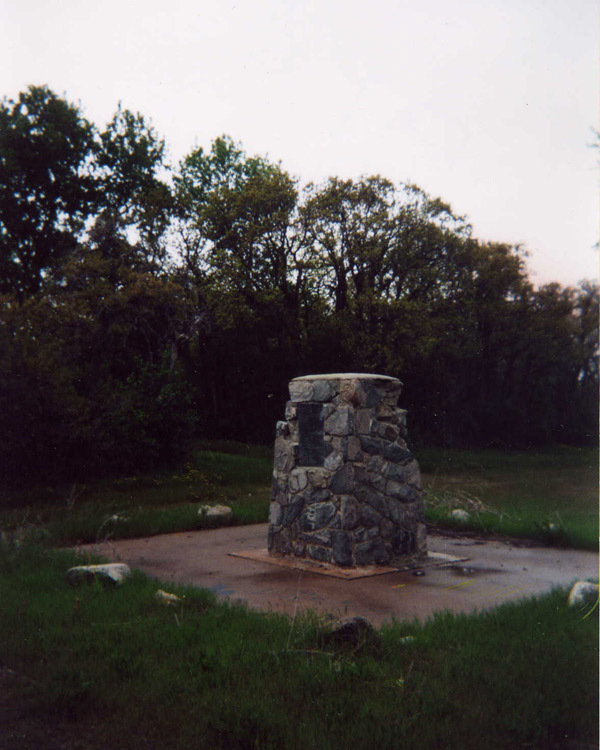 The Elias Adams Monument: The monument to Elias Adams is located at Pioneer Memorial Park (Elias Adams Monument Park). Monument photo 1, photo 2, and photo 3 are provided courtesy of Dirk Smith. 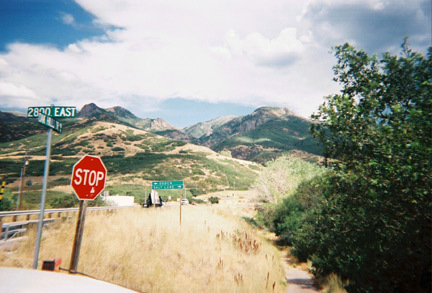 Photograph of Adams Canyon in Utah: Adams canyon was named after Elias Adams. In this shot of Adams Canyon (canyon on right side of photo) you will see the street marker for the entrance and the dirt road leading to the Pioneer Memorial Park. The major highway in the center of the photo is Highway 89. The photograph and information is provided courtesy of Dirk Smith. 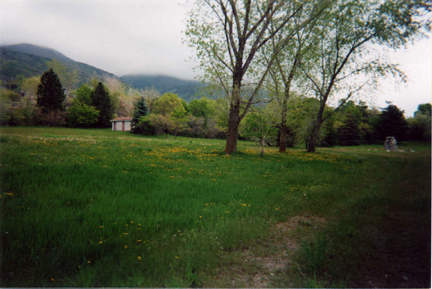 Photograph of Elias Adams Reservoir: The first reservoir erected in Utah, buit by Elias Adams and his sons. It was originally a slucing device and later became a reservoir. 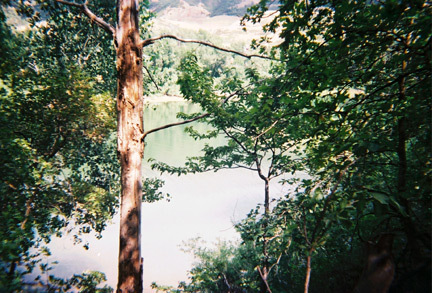 The reservoir is now known as "Andy's Pond." Photograph and information courtesy of Dirk Smith. 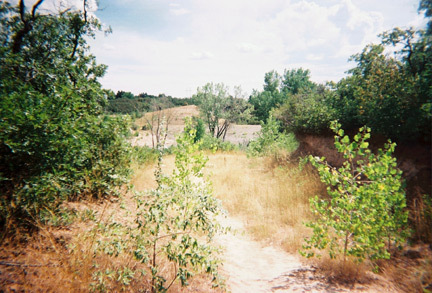 Photograph of Elias Adams Reservoir Dam: The dam is to the left in the picture. Photograph is provided courtesy of Dirk Smith. 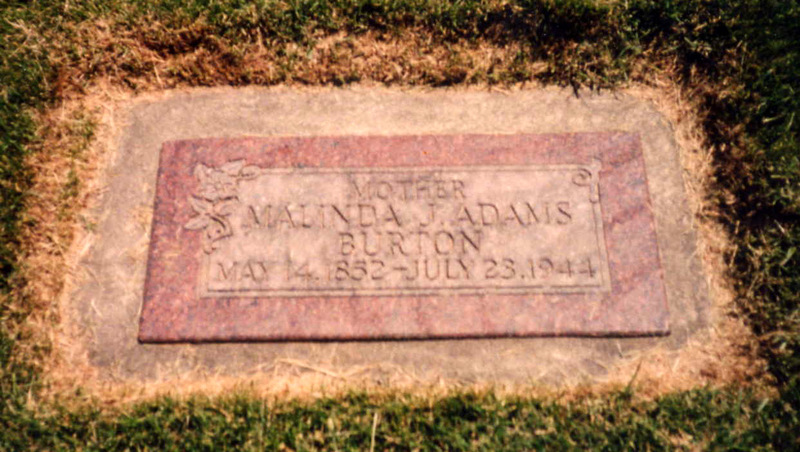 Malinda Jane Adams Burton's Headstone: Malinda was also buried in the Kaysville Cemetery. The headstone inscription reads "MOTHER MALINDA J. ADAMS BURTON MAY 14, 1852 - JULY 23, 1944." Photograph is provided courtesy of Dirk Smith. The Life History of Mary Ann Pilling Adams: Mary Ann Pilling married George Washington Adams, son of Elias Adams. 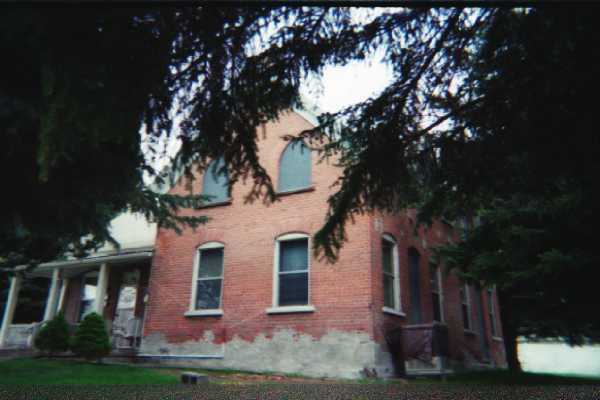 The Home of George Washington Adams: The George Washington Adams Home is one of the oldest homes in East Layton, Utah. 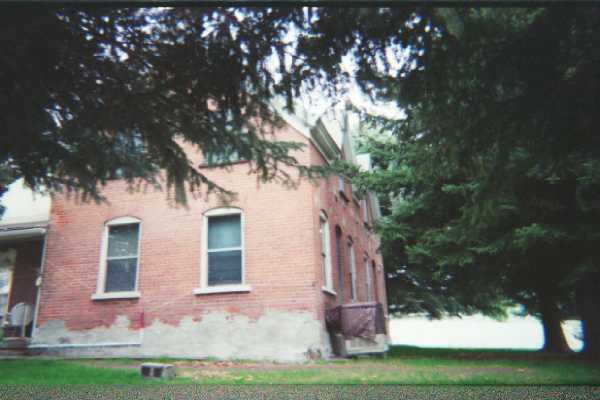 It is on the Utah state registry of century homes. 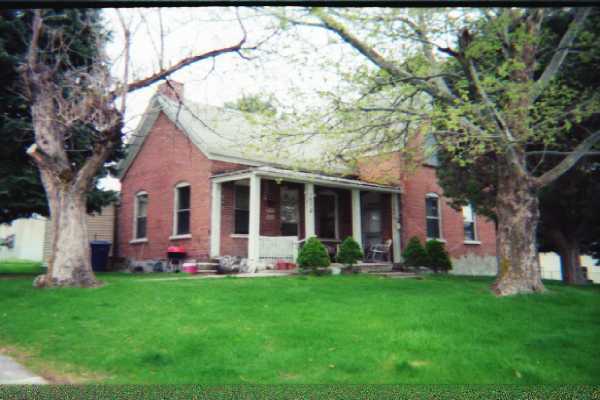 The home is located at 1572 East 1000 North, in Layton.Photo 1, Photo 2, Photo 3, Photo 4. Photographs and information courtesy of Dirk Smith. 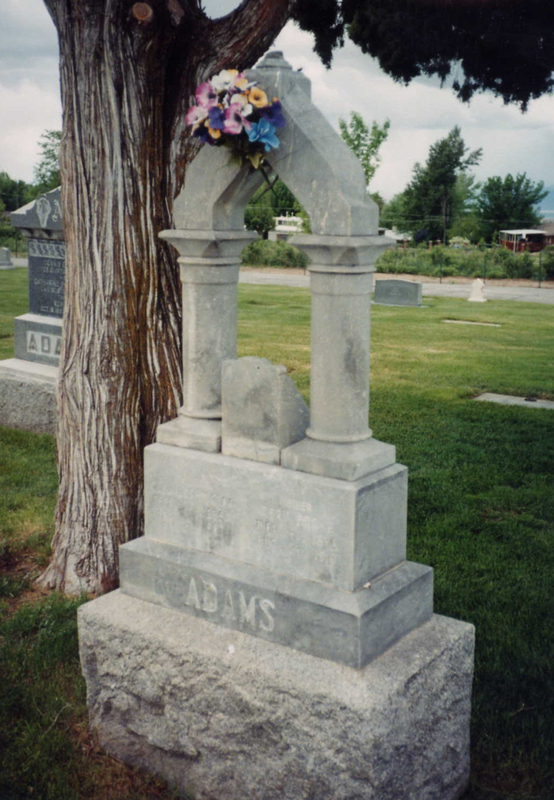 The Headstone/Monument Stone of George Washington Adams and Mary Ann Pilling Adams: George Washington Adams and Mary Ann Pilling Adams were buried in the Kaysville Cemetery in Kaysville, Utah. 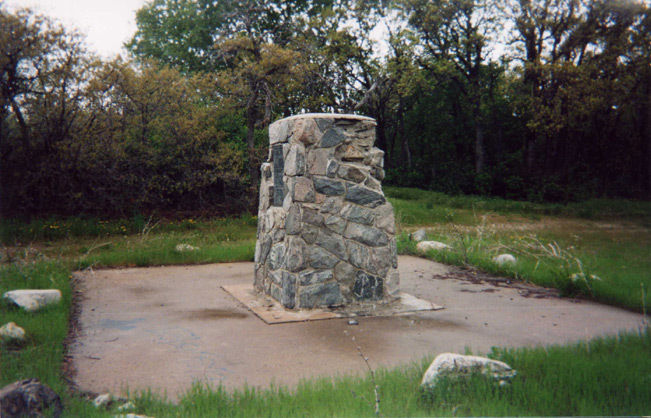 The monument stone has the following inscriptions: "Marker Transcription (Facing East): FATHER GEO. WASHINGTON FEB. 20, 1836 FEB. 5, 1903 MOTHER MARY ANN P. MAR. 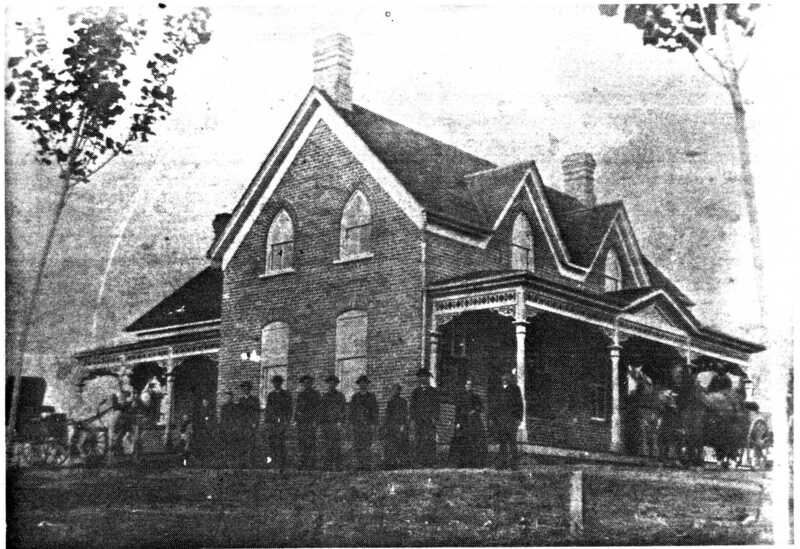 31, 1836 AUG. 23, 1910 ADAMS. Marker Transcription (Facing West): In Memory of GEORGE WASHINGTON Born Feb. 20, 1836 Died Feb. 5, 1903 ADAMS." Photo 1 facing west, photo 2 facing east, and photo 3 facing east. Photographs and transcriptions provided by Dirk Smith. 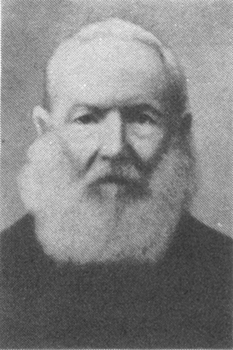 Photograph of Andy Adams: Andy Adams is the son of George Washington Adams, and grandson of Elias Adams. 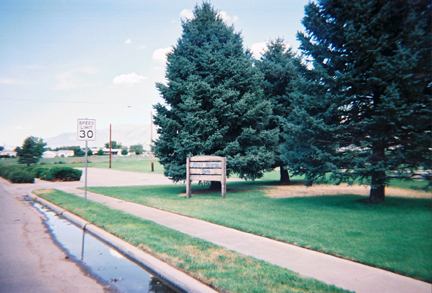 Andy Adams Park: Andy Adams Park is located on the land formerly farmed by Andy Adams, at about 1100 North and Emerald Drive (just around the corner from George Washington Adams' Home). We have recently heard that a new school will soon be built on the property that belonged old Adams farm, including Andy Adams Park. We have also heard that they may be a new Andy Adams Park located somewhere else in town. We have not been able to confirm this yet, but will post an update as soon as we can confirm what we have heard. Picture of Andy Adams Park, and its location information are provided courtesy of Dirk Smith. The Life History of Harriet Ellen Forbes Adams: Harriet is the wife of Andy Adams. Photograph of Harriet. Hazen F. Adams and His Violin: Hazen Adams is the son of Andy and Harriet Adams. He was well-known for his musical abilities. Obituary of Hazen F. Adams: The obituary is dated October 29, 1983. The source of the obituary is one of the local newspapers--we are not sure which. Hazen & Sylvia Adams' 50th Wedding Anniversary: A newspaper article announcing their fiftieth wedding anniversary. Personal Histories of Sylvia Elizabeth Flint Adams: Sylvia is the wife of Hazen Adams. An Interview with Sylvia Elizabeth Flint Adams: An interview with Sylvia Adams by her great-granddaughter. Sylvia Adams' Birthday Announcement: A newspaper announcement of a party celebrating Sylvia's eighty fifth birthday. Headstones of John & Peggy Pilling: John and Peggy Pilling were the parents of Mary Ann Pilling, who married George Washington Adams. 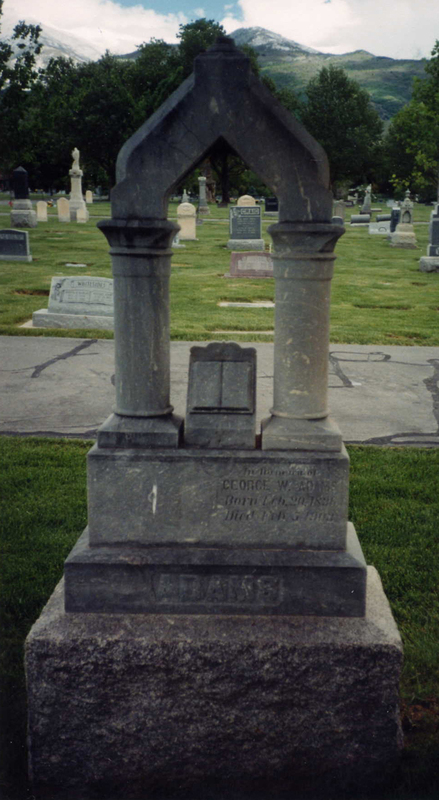 The Pillings are buried in the Kaysville Cemetery in Kaysville, Utah. 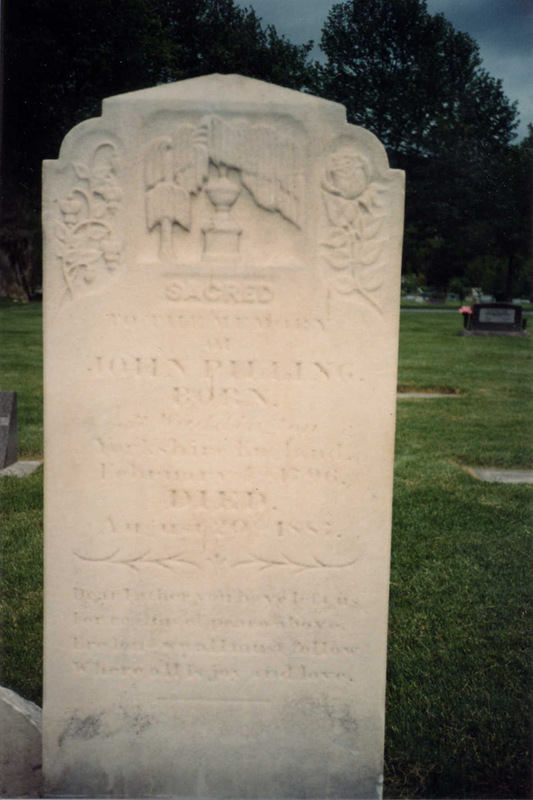 John's headstone which reads "SACRED TO THE MEMORY OF JOHN PILLING BORN WADDINGTON YORKSHIRE, ENGLAND FEBRUARY 4, 1796 DIED AUGUST 20, 1887 DEAR FATHER YOU HAVE LEFT US FOR PASTURES OF PEACE ABOVE." (The remainder of the inscription is too difficult to read.) Peggy's headstone which reads "PEGGY WIFE OF JOHN PILLING BORN IN BOLTON (on Bowland?) ENGLAND JANUARY 17, 1799 DIED JULY 7, 1874 (Poem too difficult to read) S.L. JONES." Photographs and transcriptions are provided courtesy of Dirk Smith.